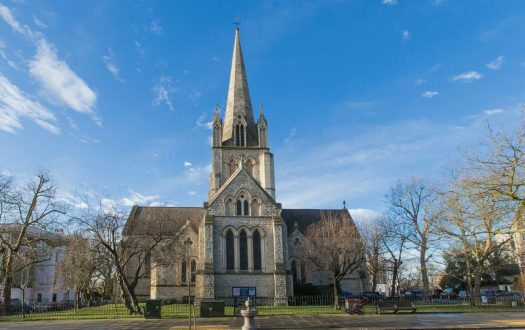 Limestone, designed by the noted Durham architect C Hodgson Fowler and built with steeple and porch in the Old English style in 1879. It occupies the site of two previous chapels of ease. From the outside it seems deceptively large, as the long wall runs parallel with St Johns Road. Inside, however, it is tiny, seating 120 at most. Two banks of pews are separated by one central aisle. There is some very nice stained glass, especially a side window depicting an angel and child. 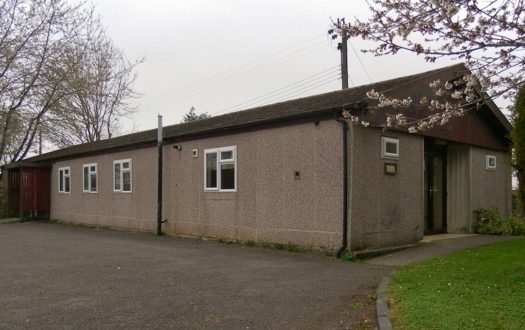 An appeal is currently being launched to pay for an extension that will house loos, a kitchen, a quiet room and social space. This is a true village church with enthusiastic volunteers, witnessed by the albums of photographs on display to celebrate the craftsmanship of kneelers and flower arrangements. 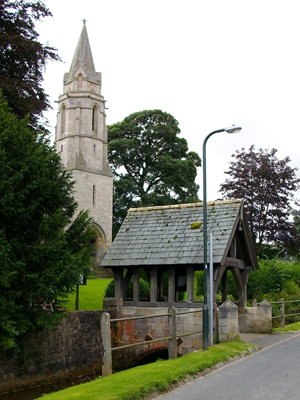 The church advertises and supports village activities such as the duck race (plastic ducks being raced down the beck that runs along one side of St Johns Road) and the local primary schools bank holiday fun day for children. A beautiful Yorkshire village a little over a mile from the main road, with stream, one shop, and an indigenous live duck population. It is set in the agricultural triangle between Knaresborough, Boroughbridge and Ripon. The spring bulbs, many planted by residents in common ground, are a glorious sight. The Very Revd Keith Jukes, dean of Ripon and Leeds. Since the parish is a benefice of the cathedral, the dean is also its vicar. I counted 29 in the congregation and 16 in the visiting choir from Burton Leonard. It sounds a small number, but was quite substantial, given the small size of the church. The sidesman giving out the service sheets said hello. I was also approached by a churchwarden who introduced himself and asked me where I was from, and also told me about this particular service. Finally, as the members of the congregation entered, they said hello to right and left as they moved down the church. Standard dark wood pews, rather narrow from front to back, with carpet to soften the effect. Beautiful wool worked kneelers, some with standard patterns, but others of local views and buildings, cats, dogs, mice, etc. Sufficiently comfortable for an hours service. The visiting choir were rehearsing, and there was a good deal of talking at the front of the church. This quieted down, and the last few minutes were occupied by an organ solo, the slow movement from Winter (Vivaldis Four Seasons). The service opened with a lively choral introit, after which the dean said: "Well, with such a rousing beginning, these next words are very poignant." He then went on to recite the scripture sentence: "Proclaim the glory of the Lord amongst the nations, his marvellous deeds to all peoples: great is the Lord, worthy of all praise." There were no books. A full service leaflet for the day was provided, plus a sheet with the notices for the week. An electric piano keyboard for the introit, and the church's two-manual organ for the remainder of the service. It wasnt the warmest of mornings, and I was happy to snuggle up to the radiator, which was on! Vested priest and robed choir, traditional Anglican service. Jazzy introit, hence the keyboard, but good standard hymns. 8 – The dean's first comment was that younger priests had described the days readings with a rather unkind word. He confessed that the readings were not necessarily the easiest to connect up or make relevant, but he did it, using a personal anecdote. And he got absolute and intense silence while he did it! The readings were Song of Solomon 2:8-13 (my beloved comes to me and bids me go away with him), and Mark 7:1-8, 14-15, 21-23 (mere lip service does not honour God; what comes out of a man defiles him, not what goes in). He related these passages to genuine love and worship. 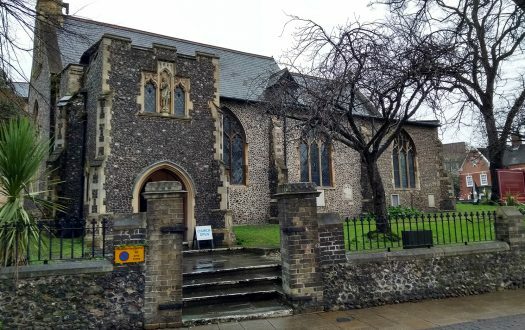 The obvious thought and care which had gone into preparing this special service, which also marked the launch of the appeal for the church extension. The first hymn was in a key too high for a contralto, so I defaulted into harmony. By the second hymn, my voice had warmed up. This can happen when theres a choir with real sopranos around. The lady in the pew in front of me turned round to thank me for my singing! Not, I think, the harmony. We got into a conversation about the projected building works, the history of St Johns, and her recent visit to London. She steered me toward the refreshments. Tea and coffee in disposable cups, plus biscuits. 8 – I found the style of worship congenial. The people were friendly and welcoming. Handshakes at the peace, with no mention of swine flu precautions. The windows of wonderful Victorian stained glass.